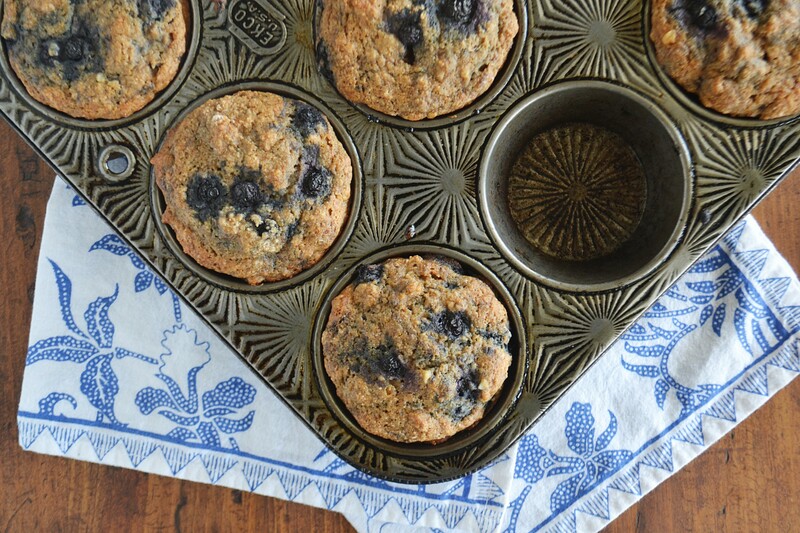 My kitchen smelled so good recently, and it was all thanks to these beautiful little blueberry banana nut muffins. I honestly can’t remember the last time I baked just for me — not for work or with the intention of bringing it to a party or as a gift — but these muffins looked so delicious when I saw them online that I told myself “but they’re good for you!” and went for it. And, oh man, were they good. The recipe is super healthy, so it meant adding a few things to my grocery list (things like coconut oil and spelt flour, which were both at Market Basket) but that’s the kind of path I’m trying to get on these days, so it was good timing. Spelt is an ancient relative of durum wheat that originated in the Near East over 8,000 years ago. It has a great nutty flavor and has never been hybridized, so using it instead of all-purpose flour adds whole-grain nutrition that’s easier to digest than all-purpose flour (although it’s not gluten-free). 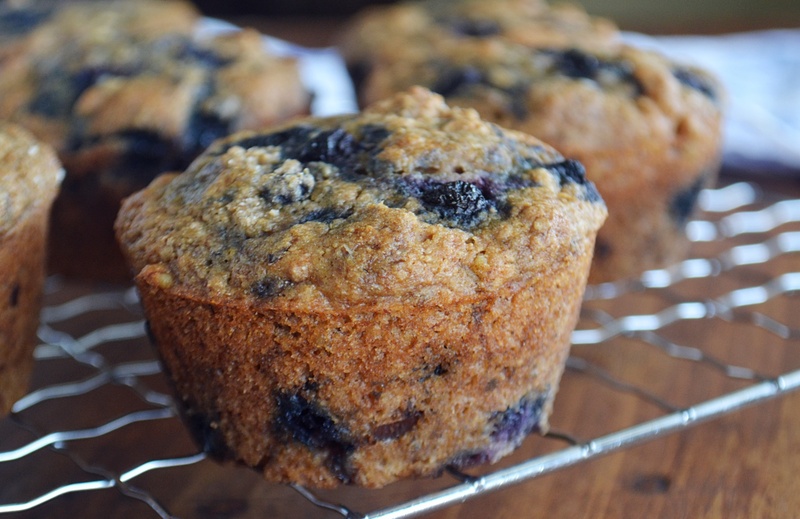 Just sweet enough, flavored with banana, and loaded with blueberries and walnuts, these muffins truly taste as good as they are for you to eat and enjoy. They’re also vegan, soy-free, and refined sugar-free, but sacrifice nothing in flavor. I left a few with my sister last weekend and she texted me that my 2-year old nephew devoured two of them, so if that’s not proof enough, I don’t know what is. I know I’ll be making these tasty muffins again soon — whether or not I share them is another story. Preheat the oven to 350 degrees, place a rack in the middle of the oven, and grease a 12-cup muffin tin. In a medium bowl, mash the bananas and measure out 3/4 cup (you can freeze any leftover banana for a smoothie). To the 3/4 cup of mashed bananas, add the almond milk, vinegar, maple syrup, and vanilla. Give it a few stirs with a whisk and set aside. Over low heat, melt the coconut oil in a small pot and set aside. In a large bowl, whisk together the spelt flour, sugar, baking powder, cinnamon, salt, and baking soda. Whisk the coconut oil into the wet ingredients, then make a well in the dry ingredients and pour the wet ingredients into it. GENTLY stir until just barely combined, then use a rubber spatula to fold in the walnuts and blueberries. You may still have a few dry spots in the batter — that’s okay. The important thing is not to overmix, or you’ll have some seriously dense muffins! Portion the batter evenly into the muffin cups. The batter will be very light and fluffy and you may feel that you’re over-filling, but don’t worry. Bake for about 25 minutes, or until domed and golden, and a toothpick or skewer inserted into the center comes out clean. Allow the muffins to cool in the pan for about 5 minutes, then transfer to a wire rack to cool completely.